There are two separate games in Madly Wild by Novomatic. This slot has a base game and a top game, so you have twice the fun in one slot! It’s quite a traditional slot, especially in terms of the symbols and the general design. This slot looks exactly as it would if it were a standing slot machine. It hasn’t been made to look like most other online slots. Madly Wild will definitely appeal to gamers who use to play in arcades. It’ll also be loved by players who miss the old days and feel like slots and casinos have lost their charm now they moved online. This slot from Novomatic gives you the retro, nostalgic vibe but with all the convenience of being an online slot. You can play online slots from any device and from any place, as long as you have an internet connection! Many Novomatic casinos have a mobile site or a mobile app to allow you to play on the go, on your tablet or smartphone. Most of us lead busy lives nowadays so this makes playing super convenient. In addition to being a game review site, we also are a casino review site! Check out our reviews of the top Novomatic casino. Read the review of a casino to see if it offers mobile play. To play Novomatic games for real money, you will need to make an account at a Novomatic casino. We’ve made it easy for you and all you have to do is click the link in the review and follow the instructions. 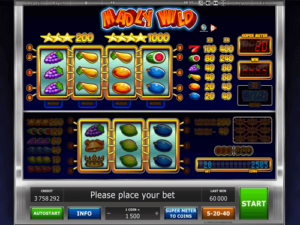 If you like the look and feel of Madly Wild, there are plenty of other Novomatic slots you will enjoy just as much! The slots that have similar vibes are: Grand Slam Casino, Super Dice, Golden X Casino, Club 2000 and Simply Wild. The base game in Madly Wild is played on three reels at the bottom of the slot. There are 5 paylines in the base game. Paylines 1, 2 and 3 run horizontally from left to right. Paylines 4 and 5 run diagonally across the reels in the same direction. The bet is 5 coins per spin to play the base game. You can set how much 1 coin is worth at the bottom of the game. All wins are paid in coins and the number of coins that are awarded per win are shown next to the corresponding symbol, on either side of the reels. The symbols in the base game are fruity and fantastic! Three cherries on a payline award 10 coins. Three lemons also award 10 coins. Three plums award 40 coins. Three grapes award 80 coins. You’ll get 120 coins for three watermelons and 200 coins for three golden bells! The golden crown symbol at this Novomatic slot is a Scatter symbol in the base game. Two golden crown symbols pay 40 coins. 200 coins are paid for three golden crown symbols. Unless you choose to gamble a payout, it will be added to your balance or your supermeter. The gamble game is very common in Novomatic games, you must choose red or black! One will double your win and the other will make it forfeit – so choose wisely! If you choose to add your wins to your supermeter, you will have the chance to play the top game once the balance reaches 200 coins or more. You can only play the top game in Madly Wild when your supermeter has at least 200 coins in it. The top game is a bit more exciting than the base game. When you play the top game, you can choose to play on three reels (for 20 coins per spin) or four reels (for 40 coins per spin). There are 10 paylines in total on the top game, which run across either just three or all four reels. The symbols are different to those in the base game. In the top game of Madly Wild, there are plums, oranges, pears, grapes, watermelons and red sevens. They all award payouts for three matches and can also award payouts for four matches (if you play on four reels). The Scatter symbol in the top game is the golden star symbol. Three golden stars pay 200 coins and four golden stars pay 1000 coins! In addition to this extra reel, the top game has some other awesome features. For one, the top game reels have gone madly wild! Wild symbols can appear on all of the reels in the top game. Also on all of the reels is a ‘nudge’ feature. This feature will be triggered automatically when the reels can be nudged to give you a more favourable outcome. Normally you have to pay to use a feature like nudging reels but this one is free! You can choose to have your wins added to the supermeter or back into your balance.